The International Space Station is featured in this image photographed by an STS-134 crew member on the space shuttle Endeavour after the station and shuttle began their post-undocking relative separation on May 29, 2011. 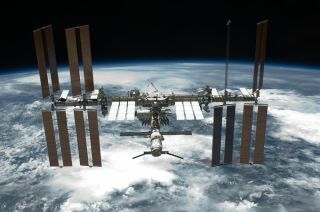 The International Space Station dodged a piece of space junk today (Jan. 13) to avoid a potentially dangerous collision. The orbiting laboratory, currently home to six astronauts from three countries, burned its thrusters at 11:10 a.m. EST, boosting its orbit slightly to take it out of range of a piece of broken satellite that was due to pass between 0.6 and 15 miles (1 and 24 km) of the station today. "At this point indications are that the debris avoidance maneuver was carried out as planned and carried out successfully," NASA commentator Pat Ryan said on NASA TV. "The crewmembers continued their work onboard while the burn happened this morning." The space junk was part of the Iridium 33 communications satellite, which collided with a defunct Russian Cosmos spacecraft in 2009, creating a cloud of thousands of bits of debris that now orbit Earth and sometimes pose a collision hazard to working spacecraft. The particular bit of space junk the station dodged today was only about 4 inches (10 cm) in diameter, but could have been catastrophic to the $100 billion outpost if the two had collided at their high orbital speeds. Potential space debris conjunctions are not uncommon for the space station. In November 2011 NASA was considering sending the three station crewmembers at the time into their Russian Soyuz spacecraft lifeboats to wait out a close pass by a piece of orbital trash. However, a subsequent analysis showed that the debris would stay far enough away to render the precaution unnecessary. NASA astronaut Dan Burbank is currently leading the space station's Expedition 30 mission, which includes flight engineers Don Pettit of NASA, Andre Kuipers of the European Space Agency, and Russian cosmonauts Anton Shkaplerov, Anatoly Ivanishin and Oleg Kononenko. The crewmembers spent today working on scientific research and routine maintenance on their football field-size home in orbit. Today's maneuver comes coincidentally timed with two other space junk events: the release of Space Junk 3D, a new IMAX film chronicling the growing danger of space debris in orbit, and the looming crash of the failed Russian Mars probe Phobos Grunt, which is expected to fall back to Earth in the next few days.